This stylish cufflinks and tie clip gift set, is intricately engraved with a paisley print, instantly adding a touch of sophistication to the design. Sumptuously crafted in white bronze plated, this set is just the finishing touch you need to add some understated style to your business looks. 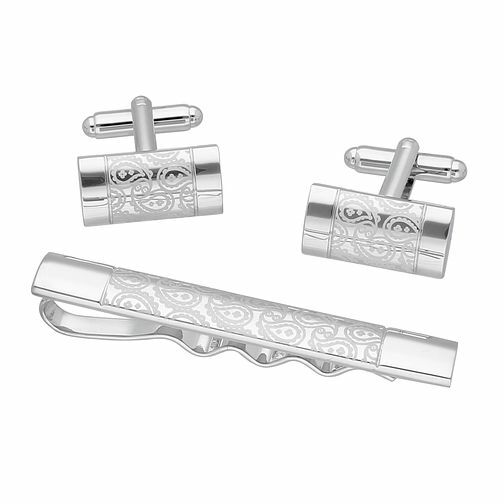 Walton Paisley Pattern Cufflinks And Tie Clip Gift Set is rated 5.0 out of 5 by 1. Rated 5 out of 5 by Anonymous from Beautiful product I ordered cuff links online, being rather uncertain as I hadn’t yet seen them in person. Let’s just say I was NOT disappointed! They were everything I’d hoped for and more. Delivery was quick and on time and the item was well protected and wrapped. Could not be happier!! !